Pirate or captain, guild brewer or breadmaker, the ring belt was a common belt worn by both men and women. They carried pouches, favors, mugs and whatnots. Ours are handmade and hand dyed so your garments won't ever have black dye come off on them. 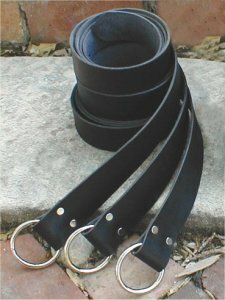 Made of 8-ounce leather, 1 3/4 inches wide. Belt too long? You can cut it to fit with a sharp pair of scissors!